As Coach Weaver and company begin the two-week vetting process to determine who among 77 prospective recruits will make up the Generation XVI novice squads, The Racer Rowing Society looks back at MSU News coverage and recollections of the first year of Murray State's "Crew Team." 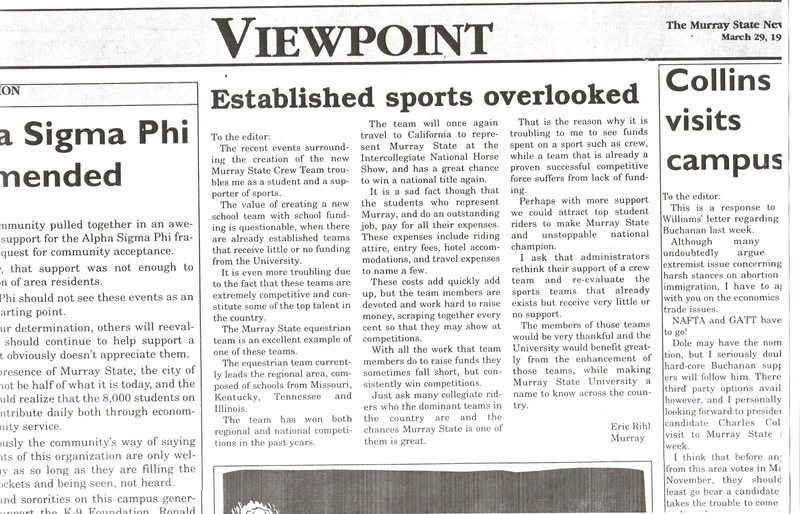 The first mention of rowing at MSU appeared in February. 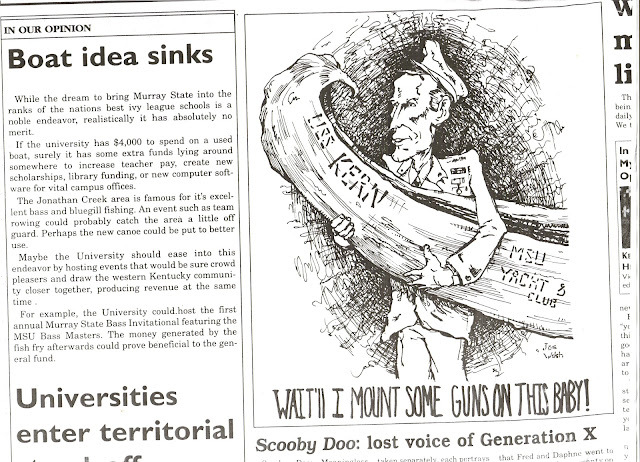 In the same issue that ran the "Murray State Navy" story, the Viewpoint section included criticism of Pres. Alexander's "Boat Idea" along with a fun editorial cartoon. 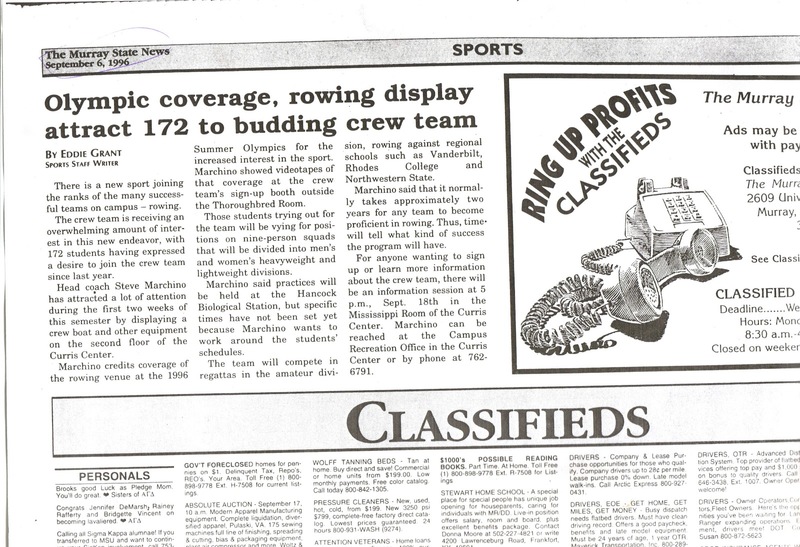 In the final weeks of the spring semester, the university was ready to proceed with its plans of starting a rowing team with the announcement of the hiring of Steve Marchino. 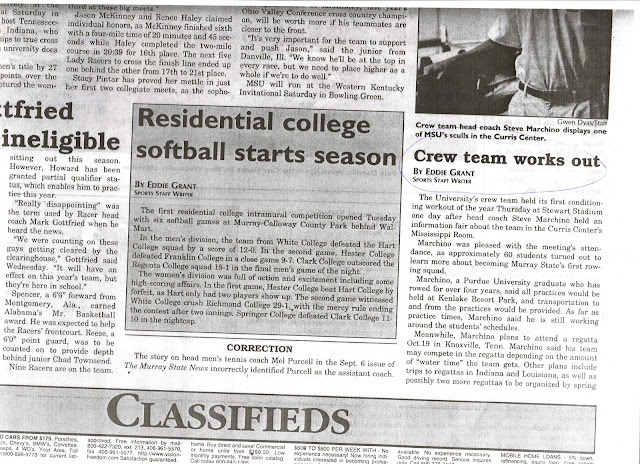 A dedicated crew office was installed within the Campus Recreation suite on the first floor of the Curris Center. The team's first two shells (Rosemary Crisp and the Libby Hart) were placed on the second floor of the Curris Center just outside of the T-Room through the summer. 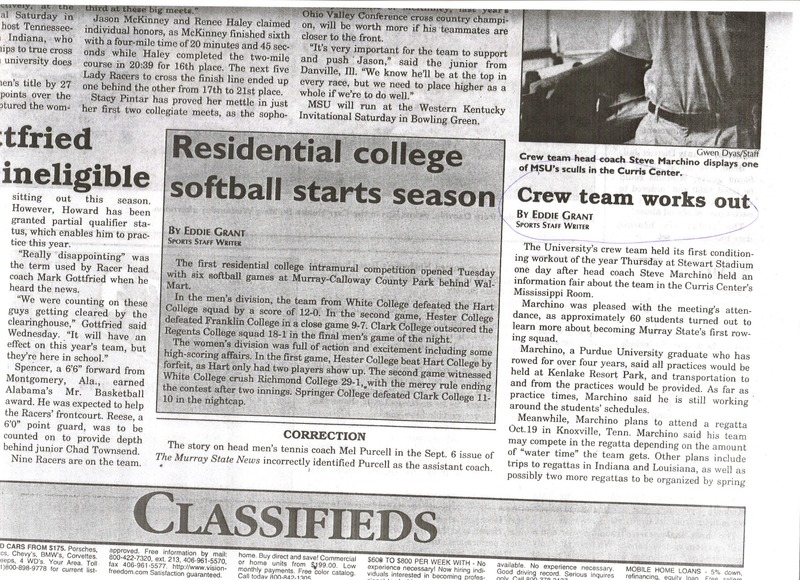 During the summer of 1996, Dan Lavit signed on as assistant coach for the team--he has remained an integral part of the program ever since. Steve and Dan actively recruited prospective rowers from the Curris Center during Orientation, Great Beginnings, and the first two weeks of the fall semester. The first team tryout was held at Stewart Stadium. The team only had 8 or 9 Concept 2b ergometers; these were not used for roughly a week. Instead, for the night of tryouts and the first few practices, we did a lot of running around the track and stairs (we also ran from the stadium to the Murray City Park trails). Some of us were definitely up to this. Others were definitely not (I remember a few guys sneaking off the track to smoke cigarettes in the middle of tryouts--these guys did not make the team). It wasn't until at least a week after tryouts that we began training on ergometers. They were stored in the football weight room where land practices were held consistently for the first three years of the club. By this point, the team's numbers settled to about 40; there were enough people to field two men's 8s and two women's 8s (plus about half a dozen alternates). The team did not complete in the Knoxville race as Steve and Dan had hoped. We did not start water practices until late September. 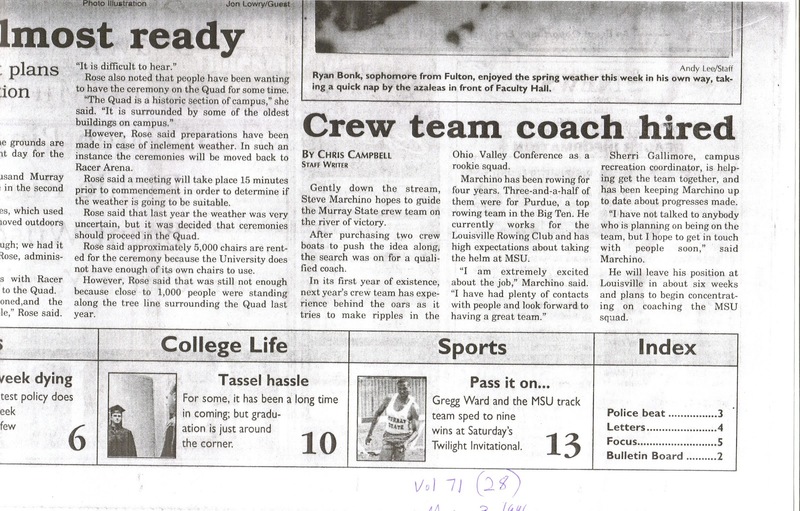 None of us had any experience with the sport and--with the exception of Steve and Dan--we didn't have any experienced rowers to look up to. 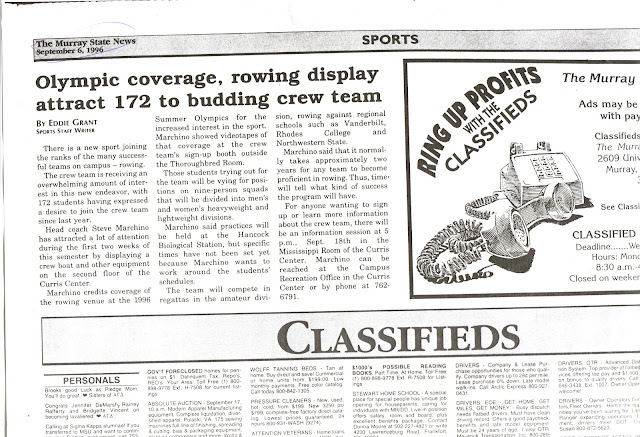 Suffice to say, learning to row in 1996 was tough. Although we did not compete in any head races during the team's first season, in mid November (on the night of the first snowfall!) 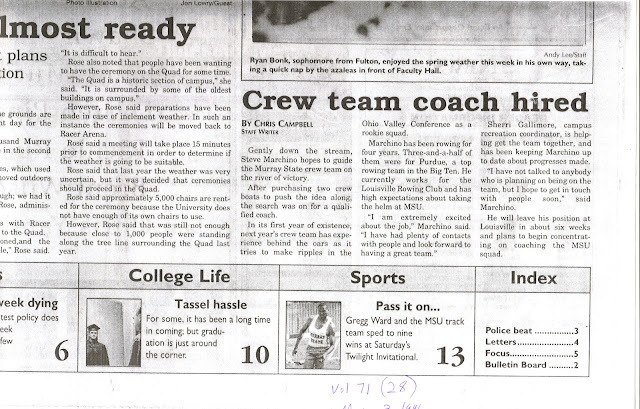 we took an overnight trip to Louisville for a private clinic facilitated by the coaches of the Louisville Rowing Club. During this all-day event, we learned about the history of rowing--tracing the activity to ancient civilizations. We were then coached through an ergometer workout. Finally, we used LRC's 8s and 4s for several hours of training on the Ohio River. It was a great learning experience--made all that much more memorable because by the time we took the boats off the water, it was dangerously cold! After the Louisville trip, we continued land practices for several weeks. But because we did not have a boathouse or a dock, water practices were suspended until the spring--when conditions for storing the boat and putting it in the water were more manageable. We ended the first season with a Christmas banquet at the Kenlake Resort Bayview building. We played "Secret Santa," ate BBQ chicken, and did some light dancing. Most of the 40 who made it through tryouts and the first few weeks remained through the end of the season.